The Rubicon Extreme-Duty TJLA suspension system is the most advanced, best performing suspension system available for the TJ. 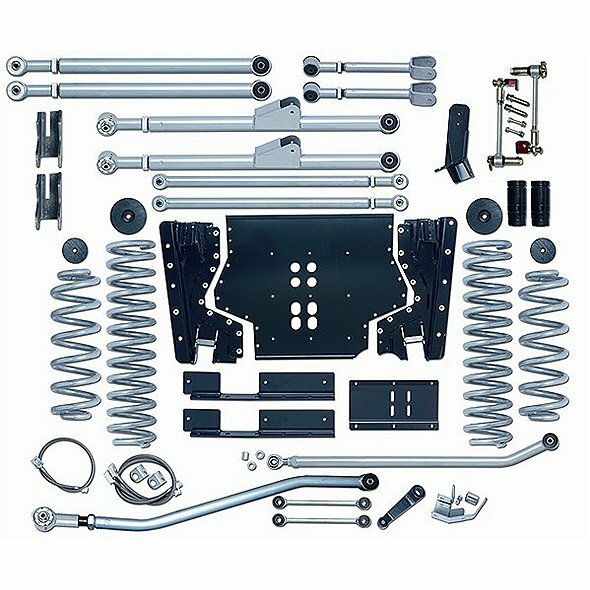 Designed as a complete replacement suspension system, the Extreme-Duty kit maintains proper control arm and steering geometry by using our longer than stock control arms. The given is improved stability, the bonus is reduced torque roll, brake jack, enhanced traction, and climbing ability. Our TJLA system was the first of its type, and is still the industry standard. We have improved our TJLA with the addition of a 3-piece belly pan, which improves service access to T-case and trans. To improve performance even more, we have worked extensively and calculated the right valve codes for proper shock dampening with our Extreme-Duty mono-tube shocks. 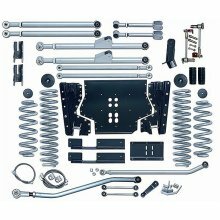 The kit comes complete with all necessary components including new, heavy duty 4130 steel arms measuring 36" long, a high clearance cross member, and relocated and adjustable front and rear track bars. This kit is 100% bolt on, however, it does require the removal of the factory lower control arm brackets.